Les Voirons is the massif east of Geneva, and north-east of Mont Salève. This is a great loop, mainly on gravel roads up high, but also on some trails. Plenty of views of Lac Léman (Lake Geneva). 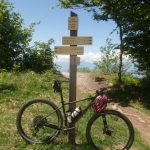 Considering that I have cycled Mont Salève probably a hundred times or more, it’s crazy that I don’t know the next mountain over very well. 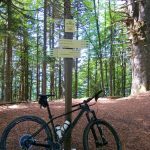 My Strava advice: Focus on following adventurous cyclists that live nearby or where you may want to cycle. It makes for timeline full of ideas. 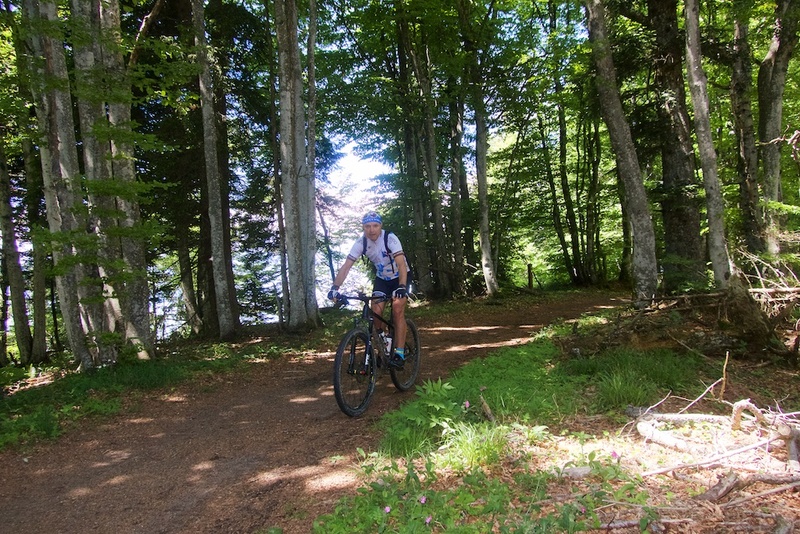 This route was inspired by the great adventure cyclist Chris White – his web-site Ride Far. 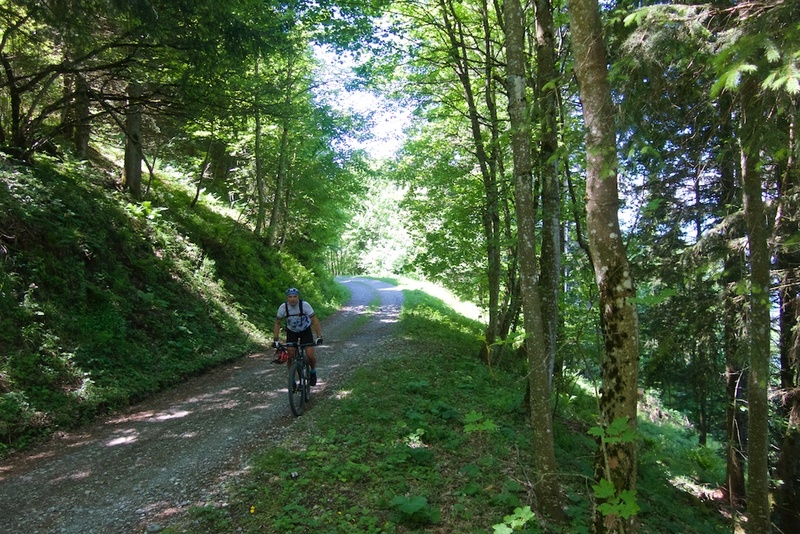 On Strava, he rode a much longer loop than mine – see here – that included the gravel climb to Les Voirons. 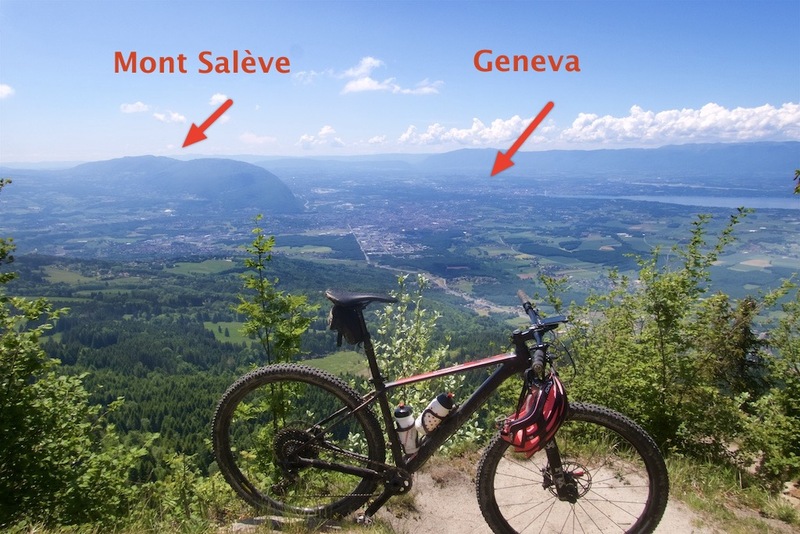 I got the map out, designed this easier route focused around Les Voiron that includes three cols, and the high point: Le Signal des Voirons (1480 metres). 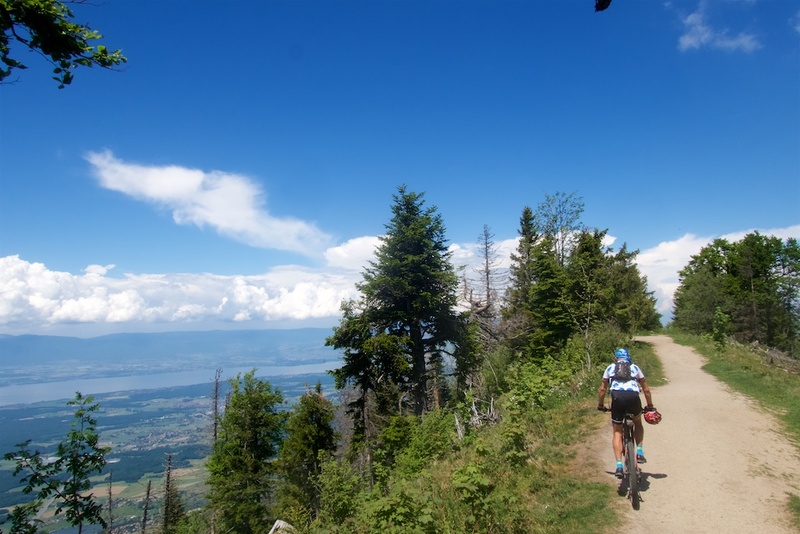 I started in St-Cergues, heading up immediately. Once above the town, the hairpin-filled road is what I would call “formerly paved.” Terrible condition. This ride is not for a road bike. 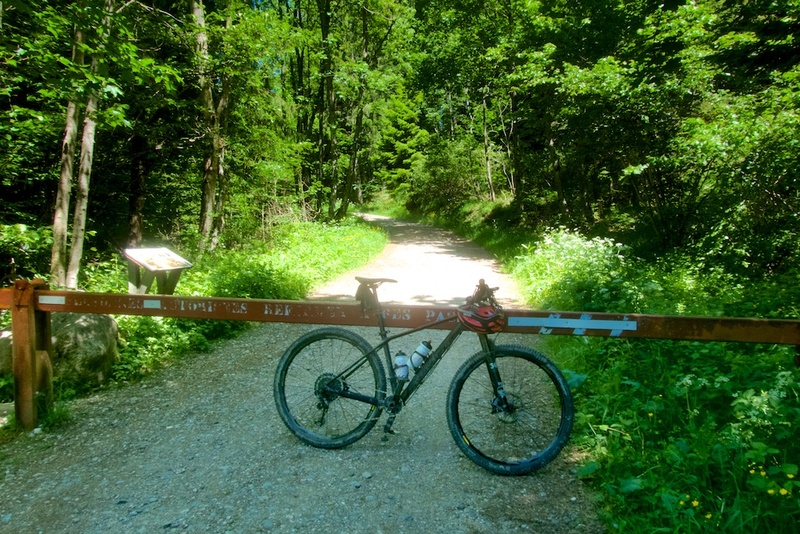 At perhaps 950 metres altitude, it becomes full gravel, and is closed to cars …. not that I saw any below. It’s not crazy steep, just a very enjoyable, super-quiet, climb through a light forest with views here and there of the distant lake below. A couple of kilometres from the summit I joined the main paved road. This leads to a couple of monasteries, and a big parking lot for the many hiking trails. 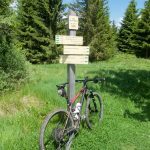 To get the here by road bike, you need to climb Col de Saxel (943m) and exactly at the Col, follow the signs and head much higher – it’s labeled on the map in this old post. I cycled the extension once in ….. 2006! 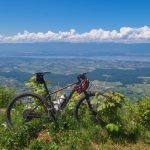 As the paved road ended close to but below the mountain’s summit, I jumped onto trails and first headed to the very highest point, Le Signal des Voirons (1480m), and enjoyed the views. Next, was the highlight of the ride for me. 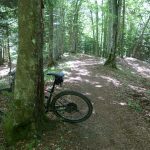 I followed a good quality trail across the top of the massif for several kilometres, passing three cols along the way – all labeled on the map. It’s wooded, but high and very rideable. So much fun. 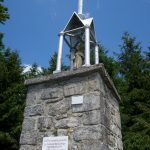 I did a quick there/back to Col du Pralère and Notre Dame du Pralére – an Oratoire on a cliff lookout. The way down is initially tough. 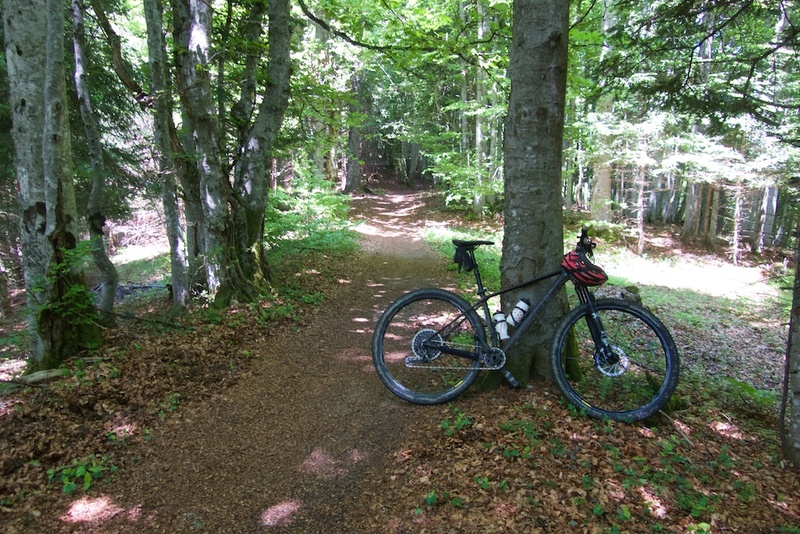 An old forestry road with huge ruts from rain, and weather, but it soon becomes a big modern gravel road – no cars though. I descended lower, but I had designed a route to never get too low, finally climb up briefly to finally rejoin the hairpins above St. Cergues back to the start. 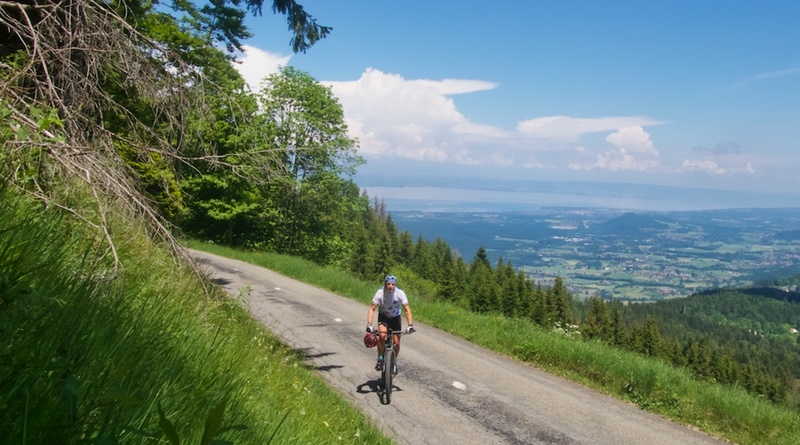 I’m glad that us “adventure cyclists” can inspire each other and I agree that this is a fun climb that the Geneva cyclists should explore more often. 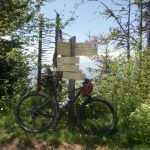 You said that the ride is not for a road bike; that may be true for the way that you descended, but I climbed up the same dirt road as you and then did most of the traverse along the ridge all on a road bike with 23 mm tires and a 36-32 lowest gear. It’s not the ideal tool for the job, but it worked for me since the rest of my 150 km ride was paved and not too steep. Your advice is still correct though because if I had been doing the loop that you did, I would have taken a different bike. 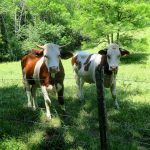 But for people who are looking for an alternative way to Col de Saxel or the Vallee Verte, then the dirt road is definitely an option even on a road bike.